If you're a careful driver, you probably keep your eyes on the road, you drive defensively, and you keep your distance from unsafe motorists. Accidents can happen to even the most careful drivers, though, and they sometimes occur because of a bad road hazard. If these or any other hazardous road conditions caused your accident, you need to act quickly – evidence can disappear, and that can jeopardize your case. This is No Fee TV, where legal help is always free. Hello and welcome once again to No Fee TV, where legal help is always free. First the robins and now the orange barrels. Road construction season is underway in western Pennsylvania. So today we're talking about construction zone laws. We'll also discuss what to do if you are injured in an accident caused by a dangerous road condition. As always, we welcome your questions on today's topic at 412-333-PCNC. Joining me in the studio are two of the partners from Edgar Snyder & Associates. We have Managing Partner and Attorney Richard Rosenthal. Welcome back, Rick. And also—attorney Jason Lichtenstein. And it's nice to see you again too, Jason. Thank you. You too, Shelly. Thanks for being back with us. Rick, you have some experience in this kind of thing. Unfortunately, I guess, but tell us a little bit about that. Well, for the first 10 years of my career I defended PennDOT and different state agencies, and unfortunately a lot of the accidents that occur in construction zones have PennDOT as a party in the case. And for the last 23 years that I've been with Edgar, we've been handling those type of cases with some frequency. Well, what are some of the hazards that have caused the injuries? I could name a few, I'm sure. I'm sure everybody out there could. But tell us a little bit about what you've seen. A lot of what causes the accidents in construction zones are what people are not expecting. So, I remember one of the first cases that I handled was a raised manhole cover. And a fellow was operating a motorcycle going down the road. You had a 2-inch raised lip. And they had milled the road, which means they removed the top levels of asphalt. And you had these high lips that were concrete at the base and steel at the top, so when the motorcycle would come down the road it would hit it flush and it would cause the operator to go airborne. And the types of injuries that people suffer in those type of construction zone accidents, unfortunately, are horrific. And that kind of thing, even with a car, I feel uncomfortable going over those. Cars can get damage that occurs where they're injured in some way; there's a flat tire. But with motorcycles, unfortunately because there's no steel around you, the operators are at the mercy of what has been left on the road, and it's not nice. And you would think they can't see it in enough time, as I'm assuming is the issue...or? They don't see it. Because you have a black road that has had a milling operation where they've removed the top of it. Some operations they'll put orange paint around these things to identify it; some they won't. They almost never have signs up identifying that there's, in fact, a problem—although occasionally you will see a sign that will say "watch manhole cover." And so, clearly what exists in all these construction projects is there supposed to be what's called a maintenance and protection of traffic plan. And that is supposed to have the signs up that inform the drivers of the potential hazards. When they're not up or they're covered, that's when accidents happen. What are some of the laws that apply to the construction areas? Well, first of all, when you're driving in a construction zone you have to have your lights on at all times. And failure to have your lights on can be a viable traffic violation. You also were reducing your speed when you're in the construction zone. What about drivers? What they're required to do? What else they're required to do in construction zones? What else should they have to be aware of? Drivers in work zones or construction zones have to be very careful for things that you might not otherwise expect driving down a non construction zone area. For instance, many times there are workers, flagmen, or construction workers who are nearby and as you're driving you don't expect humans to be on the road. And unfortunately, we've had quite a few cases where people are doing their jobs and unfortunately because of the need for them to be in the roadway they've been struck by automobiles not by operators not being careful. And what are some tips that you have for them? I mean, obviously pay attention. But that seems so silly. But like you said though, people are getting hit as a result. Yes. In terms of tips I think people should know that the penalties associated with traveling too fast in a construction zone are quite stiff. In fact, you can have jail associated with a penalty for operating recklessly in a construction zone and your fines that you normally would have are doubled. So I think that tries to serve as a deterrent for a lot of motorists. We have about 45 seconds before we have to take a break. With the laws that apply to drivers in Pennsylvania who are out-of-state residents—can you run through that? Sure whenever an out-of-state resident comes into Pennsylvania and utilizes Pennsylvania roadways, that person is required to abide by Pennsylvania motor vehicle laws. And the same is true of a Pennsylvania resident goes into Ohio or West Virginia, etc. With respect to construction zones, however, oftentimes the states have very similar laws. A lot of the signage requirements are based upon manual uniform codes that many states actually adopt. That's what I was going to ask. I would assume that they have to be similar because otherwise how else would you know what you're doing state to state? All right, we have to take a quick break. When we come back we're going to talk more about hazardous road conditions and work zone laws - that's all next on more No Fee TV. Welcome back to No Fee TV, where legal help is always free. And in the studio with us tonight we have attorneys Rick Rosenthal and Jason Lichtenstein from Edgar Snyder & Associates. And we're talking about work zone laws that apply to Pennsylvanians, and what do we do if we violate those laws. Well, violations can be traffic control offenses, which can give you a penalty where you're going to have a fine. But it can be as serious as losing your license or even going to jail. The civil damages are a different issue. So what happens when you're in violation and you're driving down the roadway and you cause a serious accident in the construction zone—you basically better be well insured because you can put your family or your business at risk by causing an accident in the construction zone and not following the rules of the road. And what could happen to you? Well, early on in my career I was handling a case for the Commonwealth, which stands for the proposition that the Commonwealth must provide a reasonably safe roadway that's fit for the purpose of driving. And that evolved out of a construction zone that existed near what was called White Swan Park at the time. And it's going out to the airport. And there was a lane that existed at that time that allowed people to make a turn which would cut right in front of traffic. And so, in those kind of situations, the verdicts on the cases were so high that if people weren't properly insured, they could have—or companies weren't properly insured—they could have loss of assets or the loss of their home. What about laws that construction companies or the government; what that they have to follow? What happens to them if they don't follow the laws? There's a manual on uniform traffic control devices which says what sign should be up in traffic control plans. Each state either adopts or approves that verbatim or changes the law a little bit. But failure to follow through can be a fine on the contract itself where there's money damages that the construction company may pay, but there's also civil penalties relative to a loss in court from a liability claim. Jason we want to talk about some types of dangerous road conditions, and we have a list that we're going to look at here on the screen. So maybe if you could talk about all of those for us. Sure. Objects on the road. That would include such objects as the manhole cover that Rick had mentioned earlier that's elevated and could be a hazard to motorists and motorcyclists. Isolated ice patches—now that, mind you, is not from natural accumulation of ice or snow. That is usually as a result of an underground spring that the controller of the road knows about. Whereby puddles are created and freeze during the cold cycle, or it could be runoff from an adjacent hillside. Confusing signs, or lack of signs. That's oftentimes signs are erected by construction companies or PennDOT to try to help motorists. But if they're placed too closely together or if they appear to be opposite in nature it can be...cause havoc on the driver. Potholes. In terms of potholes, if on a state-controlled roadway if you do have a pothole that's of danger my suggestion is...is that you make a call to report it. And we can talk about that a little bit later because the Commonwealth would need actual notice that there's a pothole in order for there to be liability. Shoulder drop offs or berm drop-offs is usually the edge of the roadway is deteriorated, sometimes from water sometimes, sometimes from work, tar-and-chip operations. And as a result, vehicles that go off the roadway oftentimes have difficulty coming back on, or are cause to be propelled into a dangerous situation where the car flips. Unsafe work zones is, just what it says, any time that the work itself might be ultra-hazardous in nature—drilling or welding, things of that nature causes potential risk for the motorists in the public. Pooling water is the same as we had spoken before. That can freeze and cause slippery conditions. Winding roads without lines. Obviously, roadway lines help guide motorists to keep on the roadway itself. And wheel ruts are deteriorations in the roadways just from age or from heavy trucks that cause rut rutting, which serves as a reservoir for natural accumulations such as ice and snow and when that freezes obviously it can become a dangerous condition. Now, we're hoping the ice and snow are behind us. Again, here in Pittsburgh we have no idea, sometimes. But do you have any recourse if you are in an accident and something like that happens as a result of ice or snow? You very well may. My suggestion is...is that if you're involved in an accident where you're the operator on a with a roadway condition, be it due to what you believe is ice or snow or an obstacle in the roadway or an elevated shoulder, please call our law firm. We're happy to try to help out and to give legal advice wherever we can. Every situation is different and it's very difficult to say whether someone definitely has a case. We would need to know the facts of that particular case. One thing to understand: When there's a generalized snow condition, where it's just snowing and there's snow on the roadway the governmental entity is not responsible for snow, and they can't be found liable relative to the case law and the statutes. However, if you have the government actually pushing the snow to one side and it ramps and vehicles go off of a bridge, there's case law to show that in fact the government has caused the condition which caused the people to go off the roadway, and therefore you can find the government liable and construction companies. That's why Jason saying you have to go in a case-by-case basis. When we come back we're going to take a look at what to do if you're in an accident that's caused by a dangerous road condition. That's next on No Fee TV. Welcome back to No Fee TV, where legal help is always free. And in the studio with me tonight we have attorneys Richard Rosenthal and Jason Liechtenstein. We're talking about dangers and work zones, laws, construction...a mess it seems all the time in Pittsburgh. So this is something that we really need to know about. 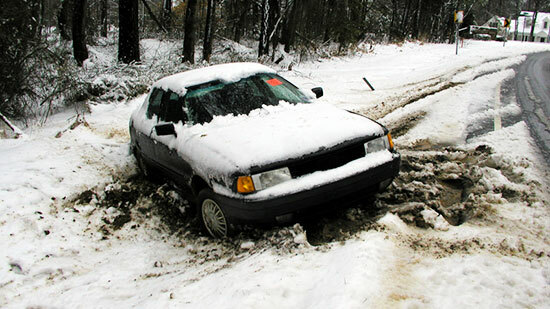 If you are in an accident, how do you know if it was caused by a poor road condition? Many times people die in accidents and have no idea why it was caused. And the police go out and they do an investigation. And they see that water was channeled across the roadway. Just like Jason talked about the case that occurred on 28, where water was channeled across the roadway, it froze as ice. The people hit the ice patch at night had no idea that in fact that they were going to lose control, because it was in isolated condition. What you really want to do is if you're involved in an accident, first get yourself to a safe place because unfortunately when you're injured and you're on the roadway as much as you would like to believe that you're in a safe place even being on the berm or off to the right of the roadway may not be safe. Then make sure that you get medical attention because clearly that's what's most important if you're injured. But clearly there's perishable evidence the...the marks on the roadway, the water on the roadway, the raised manhole cover. All of these things that, if you took a picture at the scene with your telephone or your iPhone, all of a sudden you realize why things happened which you otherwise didn't understand when the accident was occurring. So how do you find out, though, exactly who's responsible and who's behind whatever condition you find out? Is that possible to do? Well, it's funny. Many of our cases come when police officers tell that people injured in the accident, "you should go see an attorney." Huh! Potholes. I don't even want to just get started on potholes, but everybody out there that has to deal with potholes. What do we do about those? What are your options if you're injured...if you're in an accident...that kind of thing? Well, potholes kind of fit into a special category in Pennsylvania because of our freeze-thaw cycle, many of our roads have potholes. In fact, there are very few roads that don't get pot holes...pot holes that are well-traveled by vehicles. The law and potholes is as follows: If it's a state-controlled roadway, in order to recover from a civil perspective, you have to establish that this that PennDOT had previously received actual written notice that the pothole existed. However, if it's a local roadway or a municipal roadway, if the municipality should have known of the pothole because of its obvious nature, and failed to do anything about it, then liability can lie. The other interesting thing about potholes and about claims against the state is as many times with potholes you receive damage to your vehicle and you're going to be limited in most instances in being able to recoup...recoup your property damages, unfortunately. What do you do if you see one? I mean, there are many times where we drive over one ourselves. We hit it, nothing happens fortunately, or we see one and we are able to get around it. What should we do? Do we report it? Yes. I mean, if it's a legitimately concerning pothole there are a few different ways to report it and you can go to the EdgarSnyder.com website and we have more detailed information on this. But generally for state roads the number I believe is 1-800-FixRoad, and for local roads in the city of Pittsburgh you just dial 311 and you can make that report. All other roads, you would just contact the local municipality and let them know of it, and they would hopefully record it by telephone or otherwise write them or send them an email, if possible. So if it's the size of a lake, we should probably call someone, ‘cause I think I've hit a couple of those. When we come back, we're going to talk more about what to do if you're involved in an accident because of poor road conditions. Please stay with us for more No Fee TV. Welcome back to No Fee TV. And tonight we're talking about work zone laws in Pennsylvania and dangerous road conditions, and what to do if you're in an accident that's caused by something like that. So Rick, how does Edgar Snyder & Associates help victims who are involved in these types of accidents? We gather the perishable accident data at the scene. We have investigators who make sure that we can take advantage of our experience, as well as the resources to make sure we preserve the claim. And we file suit in the county where the accident occurred. When you're suing a local governmental entity or you're suing the state, you must sue them in the county where the accident occurred. What's the whole legal process? What does that involve? It involves filing a complaint, which is basically the legal paper outlining what the negligence was that caused the injury, and then outlining the injuries. And there's a process called the pleading stage, the discovery stage, and then the trial stage. And these three processes take anywhere from a year to two years before people get their day in court. I'm assuming that it's a little tough to go up against a construction company or even the government whenever you're trying to file a claim. What would be some tips or advice for people doing that? Well, the governments usually have very experienced attorneys. They've been doing the job for years and they know what they're doing. The construction companies have endless resources to defend. You need experienced attorneys, and you need attorneys that have the resources to make sure that your case can be successfully handled. Jason, let's talk to you for a second before we have to go. What does a victim need to do if they find out that they have a case with Edgar Snyder & Associates? When they call our office, we will ask for certain information pertaining to the accident, the incident. And my suggestion is...is to potential callers out there, that some basic facts be gathered if possible before that phone call is made—including the name of the roadway, the date that the accident occurred, the injuries in terms of what kind of medical treatment was received. When we get that information, we will conduct an investigation to determine whether we believe that it might be a successful case and be something that we can help the client out with. And we have a lot of people, a lot of lawyers, who are answering those types of questions on a daily basis. And we have about 30 seconds. What are the factors—just a couple—that use you would use to determine whether you have a case. Well, the factors are, especially with respect to tonight's program, the...if...if you are an operator of a vehicle and you lose control, oftentimes there's no liability because the burden is on the plaintiff to establish that it was a dangerous roadway condition that caused the accident. But the other factors are police reports and so forth to try to determine who's at fault for the accident. Thank you so much both of you for joining us here tonight. I'm not out of questions, trust me. I still have a few, but I am out of time on this edition of No Fee TV. Thanks to partners Rick and Jason for joining us in the studio today. If you want more info on construction zone laws and dangerous road conditions you can definitely want to go to EdgarSnyder.com. While you're there you can fill out a free legal evaluation form. Now, you don't want to miss next week's show. Attorney Edgar Snyder will be here, along with some special guests. We'll be talking about the Edgar Snyder Save a Life Tour, that's a unique anti-drunk driving program that travels to local high schools. So until then, thank you for watching—and be safe. Thank you again for tuning into this edition of No Fee TV, where legal help is always free. If you have a topic you would like us to cover in a future show, please reach out to us at EdgarSnyder.com. You can also connect with us on our Facebook page or on Twitter and Google+ using the hashtag #NoFeeTV. See you next week. Attorney Rick Rosenthal is our resident expert on hazardous roads and the accidents they cause. Watch him and Jason Lichtenstein discuss dangerous road conditions. We're here to answer these questions and more. If you decide to hire our law firm after your free legal consultation, we'll get to work right away and do everything we can to get a positive outcome for you and your loved ones. We investigate the scene of your accident and gather evidence to prove that a bad road was responsible for your accident. We've helped injured people just like you who need money to pay their medical bills and make up for days missed from work. If you or a loved one is suffering an injury from hazardous road conditions, hiring an attorney might be the last thing on your mind. It may seem like an added hassle, but the truth is that hiring an experienced injury attorney can ease your mind. Your case could be more complicated than you think. If you try to handle it on your own, you could end up settling for less than you deserve. Trust our law firm to help get the money you need to pay your medical bills and support your family. Talk to us to see what we can do for you.